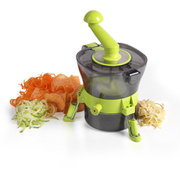 Comprised of 16cm, 18cm and 20cm saucepans, this 3-piece set lets you cook a variety of tasty meals quickly and easily. 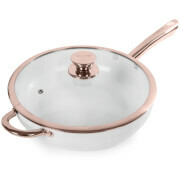 The pans in this set feature rose-gold plated stainless steel handles, for comfortable handling, and sturdy, heat-resistant, 3mm thick aluminium exteriors. Their non-stick inner coating reduces the need for oil, allowing for healthier cooking, and their bonded steel base is suitable for all hob types, making them a good addition to any kitchen. 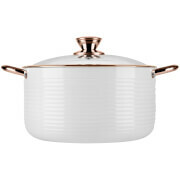 Each pan also comes complete with a tempered glass lid, for more precise cooking. The pans in this set are also oven-safe for temperatures up to 260 degrees, and require only a simple hand wash to clean, making them practical as well as useful.